More Blame Congress Than Obama For Park Woes During Shutdown : It's All Politics A national poll released Monday shows many registered voters were reminded of the importance of national parks during the federal government shutdown. Congress did get more of a bruising on perceived responsibility for the park closures, but the president wasn't left unscathed either. U.S. Park Ranger Mirta Maltes stands near the road-closed sign leading to the Everglades National Park on Oct. 7 in Miami. It may seem like a distant memory, but the images are indelible: grizzled veterans tearing down barricades at the National World War II Memorial; armed rangers blocking national park entrance roads with massive signs and government SUVs; and county officials in Utah plotting to storm and takeover five national park areas. The closure of the nation's 400 national parks, monuments, recreation areas, historic sites and battlefields during October's government shutdown became the searing emotional and political symbol of government gone awry. Now comes an indication that the political fallout, if any, may harm congressional Republicans more than President Obama. A national poll released Monday found that 60 percent of the 1,000 registered voters surveyed blamed the closure of national parks on Congress' failure to agree on a budget. Roughly 30 percent believed that the Obama administration closed parks to make the government shutdown as painful as possible. And 90 percent agreed that closing park areas was a problem. Roughly half of the respondents in every region of the country considered the closures a "big problem." 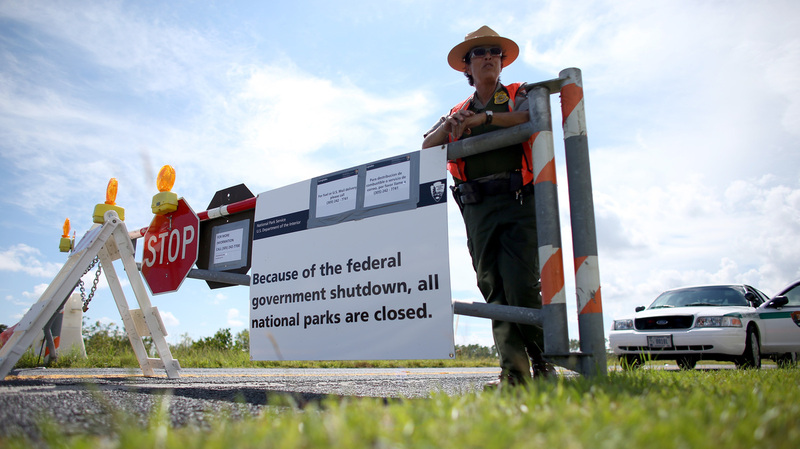 But the five-day survey, taken two weeks after the shutdown had ended, focused solely on the closure of national parks. It did not ask about any other impacts of the shutdown, such as threatened funding for the Women, Infants, and Children program, or WIC. The survey was conducted by the Democratic polling firm of Hart Research Associates for the Center for American Progress, a liberal think tank. "The closing of the parks and other public lands during the shutdown was a teachable moment," says Hart president Geoffrey Garin. More than 80 percent agreed that the barricades and closed signs blocking park entrances reminded them of the importance of national parks. And there's broad agreement about that across parties, including 90 percent of the Democrats in the survey, 77 percent of the independents and 74 percent of the Republicans. Three-fourths agreed that the closures had serious impacts on local communities dependent on parks tourism. In fact, responding to the deep decline in park tourism, governors and local officials in Arizona, Utah, Colorado, South Dakota and New York demanded the reopening of some park areas with state and private funds. Utah paid $1.6 million to get eight national parks running again. The poll also found widespread support for providing additional funding in general for National Parks and protecting them from congressional sequestration budget cuts. "Americans love their national parks and want them to be open and adequately funded," says Maureen Finnerty, a former parks superintendent who now chairs the Coalition of National Park Service Retirees. "Americans are sick and tired of those in Congress who use national parks and National Park Service employees as pawns in partisan budget showmanship games," Finnerty adds. Still, most of those surveyed blamed both President Obama (53 percent) and congressional Republicans (60 percent) for the government shutdown that resulted in the closure of parks. Relatively few trust Obama (37 percent) or Republicans in Congress (29 percent) to protect national parks and public lands. And since the shutdown, the parks closures and the survey, the nation's political focus whiplashed to the failures of HealthCare.gov, the website that was supposed to facilitate the rollout of Obama's Affordable Care Act. Garin of Hart Research acknowledges that the purported lessons of the shutdown may be fleeting. "We don't know the durability of that conclusion from this teachable moment," he says. The validity of the survey was questioned by reporters during an embargoed teleconference Friday. "Asking about national parks is almost like saying, 'How much do you love kittens?'" said Thomas Burr, a Washington correspondent for the Salt Lake Tribune . "Saying [the shutdown] is a good reminder is not too shocking because national parks usually poll pretty well." Garin responded with the assertion that "even when you explain that the point is to help reduce the budget deficit," people say "enough is enough" when parks are threatened. But he also acknowledged that the poll's respondents "don't really see any of the players in Washington as necessarily doing enough to protect parks and public lands." So, the great national park lockout of 2013 left the surveyed voters upset with and distrustful of both the White House and Congress. Only the parks survive with sympathy and reverence. The survey, which used cellphones and land lines, consisted of randomly selected adults who said they were registered voters and had cast ballots in the 2012 presidential election. Democratic and Republican respondents were nearly evenly split with a quarter identifying themselves as independents. Hart Research says the margin of error for the survey is +/- 3.1 percent.